Every Day is Christmas in Bethlehem! Great day. It was our “Bethlehem Day!” We saw all the main sites and more including Mass at Shepherd’s Field. We started by shopping in Bethlehem to support the persecuted local Christians. Then to Shepherd’s Field for Mass after which we had lunch at the Christmas Tree Restaurant (wait until you see Msgr. Droll making falafils! Then to the Carmelite Monastery and dinner. We had the Passover Lamb along with much, much more Palestinian food. I know many of you think all we do on this pilgrimage is eat :-) Enjoy the dancing! In the evening we went to visit the Bishop of Jerusalem in the Latin Patriarchate. Fifteen of our group are Knights and Ladies of the Holy Sepulchre and 10 of them received their Pilgrimage Shell from the hands of the bishop. 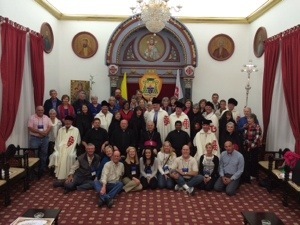 The group picture below took place with the bishop of Jerusalem. Next post: The Three Tombs – Which is the Real One?